Yue Chu was born in Tianjin, China and began studying piano at the age of five. He won his first performance competition at the age of eight, and at ten, conducted the youth orchestra and choir in the closing ceremony of the 43rd World Table Tennis Championships. In China, Mr. Chu studied with Yun-Xian Chen, Jin Zhang, and Yuan Wu. He came to Calgary, Canada at the age of 15 to study with Hung-Kuan Chen and Tema Blackstone. 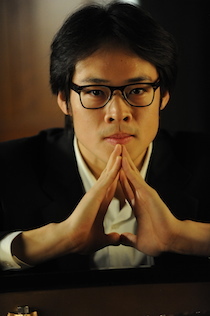 He received his Bachelor and Master of Music degrees under the guidance of Russell Sherman and Wha-Kyung Byun at the New England Conservatory, where he was the first undergraduate to receive the Presidential Scholarship in two consecutive years and was the first recipient of the Burnes Family Award. Mr. Chu received a performing diploma at the Curtis Institute of Music, where he studied with renowned pianists Jonathan Biss, Leon Fleisher, Claude Frank, Seymour Lipkin, and Meng-Chieh Liu. At Curtis, where all students receive merit-based full-tuition scholarships, Mr. Chu was the Martin and Sarah Taylor Fellow. Mr. Chu continued his studies in the Artists Diploma program at the Yale University School of Music under the guidance of Peter Frankl. At Yale, he was the recipient of the Henry & Lucy Moses Scholarship and Fellowship. In addition, Mr. Chu has had coaching with Gary Graffman, Richard Goode, Menahem Pressler, Robert McDonald, Itzhak Perlman, Miriam Fried, and Don Weilerstein. Mr. Chu has performed as a soloist with the Calgary Philharmonic Orchestra, New England Conservatory Orchestra, the Cape Cod Symphony Orchestra, the Tianjin Symphony Orchestra and many others. He has appeared in numerous competitions and music festivals, including the Bösendorfer USASU International Piano Competition, the Van Cliburn International Piano Competition, the Honens International Piano Competition, the Heida Hermans Piano Competition, the Kiwanis Music Festival, the Morningside Music Bridge, the Foundation for Chinese Performing Arts’ Music Festival at Walnut Hill, the Perlman Music Program, and the Ravinia Festival. Mr. Chu’s career accelerated after he won first prizes in the 2011 Heida Hermanns International Piano Competition and the 2012 Wideman International Piano Competition. He subsequently performed with the Northwest Florida Symphony Orchestra, the Shreveport Symphony Orchestra and the South Arkansas Symphony Orchestra. He has appeared in concerts at the Philips Collection in Washington D.C., the Dame Myra Hess series in Chicago, and the Louvre Music Series in Paris. Mr. Chu also appears frequently in recitals with a variety of renowned chamber ensembles and artists, including the Parker Quartet, the Far Cry, Eighth Blackbird, Zuill Bailey, Kim Kashkashian, Itzhak Perlman and Peter Wiley, among many others. Mr. Chu has been active in international cultural exchange programs and in music festivals. He is the co-founder and director of the 2015 Namei International Music Festival and the 2017 West Lake International Youth Music Festival. He also co-founded the International League of Artists, which brings together artists from around the world to collaborate on new art projects. In 2016, Mr. Chu joined INNUAN as its co-artistic director. Also in 2016, Mr. Chu was invited as piano faculty and guest performing artist for Morningside Music Bridge’s 20th Anniversary , a tuition free program for talented young musicians across China, North America and Poland. Recently, Mr. Chu became a Tempo Primo artist, touring under its management in Asia, Europe and North America. When not at the keyboard, Mr. Chu enjoys reading and playing sports, and likes to whip up delicious meals for his friends! In addition to his music studies, Mr. Chu has also earned a certificate from NYU in Philanthropy and Management, and a certificate from the Professional English Program at the Columbia University, Rennert International Program.